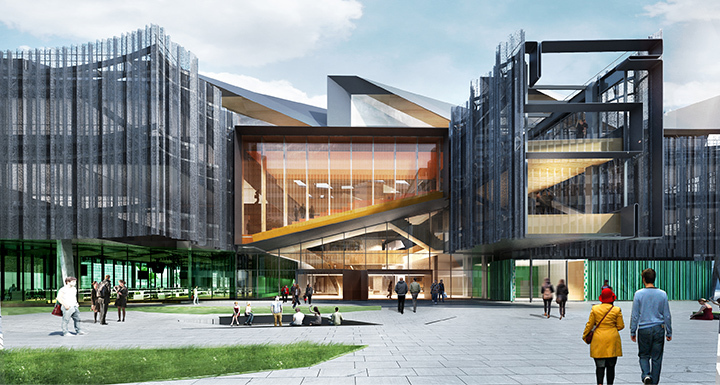 The Clayton campus's new Learning and Teaching Building has created a dynamic learning environment, and is a physical demonstration of Monash's commitment to Education Innovation. The Access Monash Mentoring Cycle program won the Equity and Opportunity Award while an Indian-Australian research partnership took the top gong in the International Education category. The University’s new Learning and Teaching Building added to an already lengthy list of awards, winning the Facilities Innovation categories. The Access Monash Mentoring Cycle program matches school students in years 11 and 12 from communities with low levels of higher education completion with students studying at the university. The IITB-Monash Research Academy was established in 2008 with the Indian Institute of Technology Bombay. The academy conducts research through a highly-collaborative PhD program across Australia and India, with 400 researchers, nearly 200 research students and over 400 research projects to date. Deputy Vice-Chancellor and Vice-President (Education) Professor Sue Elliott AM, who received the awards on behalf of the University, said she was delighted to see Monash recognised for its work in key areas of innovation and international student experience. “Providing equity of access to education is a key pillar for Monash, we’re strongly committed to providing opportunities for deserving students who may not otherwise be able to access higher education. Professor Elliott said the Learning and Teaching Building, brought to life through the vision of President and Vice-Chancellor Margaret Gardner AO put Monash at the forefront of innovative teaching, allowing the University to deliver more engaging and collaborative experiences for students through active learning. The building has 68 formal learning spaces across four floors to enable a range of new learning styles – including the dynamic ‘learning in the round’ space, interactive lecture spaces using cutting-edge technology that enables peer presentation and maximises participation, specialised computer and project -based learning, and round table styles specifically configured to encourage group collaboration. The awards are part of the Financial Review Higher Education Summit and identify leading programs in areas of innovation, education, student wellbeing and community engagement. Over 109 submissions were made for the awards and came from 38 out of 40 universities. The judges selected a shortlist of four in each category from which the winners were announced at a dinner to celebrate achievement in education.